We normally synthesise vitamin D by the action of the sun on our skin during the summer, and the reserves built up during this time will last us throughout the winter. This indicates that vitamin D can be stored within the body, and because vitamin D is an oil it is stored in the liver and in body fat. This has led to vitamin D supplement sometimes being given in a single large dose, a “bolus”. This can be an injection, and the dose of vitamin D as ergocalciferol is usually 300,000 or 600,000 units. It is to be given only once or twice each year and the assumption is that it will go straight into the fat of the body and then it will be released gradually over several months. It appears to be very convenient. But it is not quite so simple in the human metabolically active environment and this is not the way in which nature works. The normal pattern is for a gradual accumulation of vitamin D during the summer months. Experience now informs us that vitamin D supplement given as a single large dose is not as effective as when given as frequent smaller or moderate doses. Vitamin D is synthesised by the action of ultra-violet light from the sun on 7–dehydrocholesterol (7–DHC) in the skin. 7–DHC is a four-ring structure but the sun converts it into a three-ring structure, the vitamin D molecule, which has one hydroxyl group ( –OH). It then enters the blood stream and the circulation takes it through the liver. At this stage a second hydroxyl group is added. 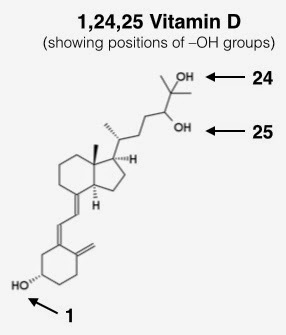 It is then called calcidiol, indicating two hydroxyl groups, and it is also known as 25(OH)D as the second hydroxyl group is in the 25 position of the molecule. Vitamin D is a pre-hormone, meaning that it must be converted into an active hormone. This occurs when a third hydroxyl group is added, this time in the 1 position, forming calcitriol, 1,25(OH)D. This process takes place predominantly in the kidneys, but also in some inflammatory cells. Calcitriol is biologically highly active, and this activity must be carefully controlled. If the blood level of calcitriol becomes too high then the amount of calcium in the blood and urine will increase to a level that might cause problems. Therefore to maintain a precise balance the amount of calcitriol produced must be matched by the same amount being de-activated. The de-activation of calcitriol is, like its synthesis, controlled by a genetically determined enzyme. Similarly it adds a hydroxyl group to the molecule, now a fourth group and this time in the 24 position. The result of this hydroxylation is 1,24,25(OH)D, which has no biological activity. CYP27A1, is responsible for both of these hydroxylation processes, the –1 hydroxylation production of calcidiol and also the –24 deactivation of calcitriol. A large input of vitamin D activates the enzyme allowing this vitamin D to be converted into calcidiol. The body’s metabolism will anticipate high levels of calcitriol. The –24 hydroxylation deactivation of calcitriol is switched on and the rate of de-activation of calcitriol will be increased. The enzyme also deactivates directly surplus calcidiol. All is well when vitamin D synthesis develops gradually during the summer months. But when we interfere with the process of nature things can go wrong. The synthesis of vitamin D in the adult is in the range of 2,000 to 3,000 units per day, depending of location of residence and lifestyle. If vitamin D is synthesised for about six months of the year, this would amount to between about 300,000 and 600,000 units per year. 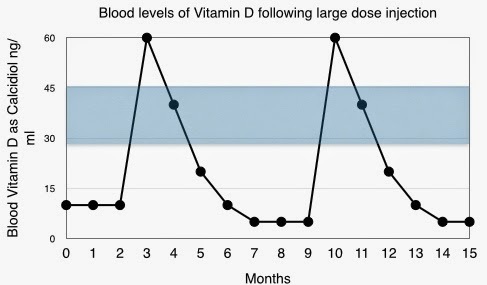 The body does not expect to receive six months or a years vitamin D in a single dose. When an injection of 300,000 or 600,000 units is given, the metabolic assumption will be that this is the start of a regular input of vitamin D and so it must be followed by a similar level of inactivation. Initially this works out well. 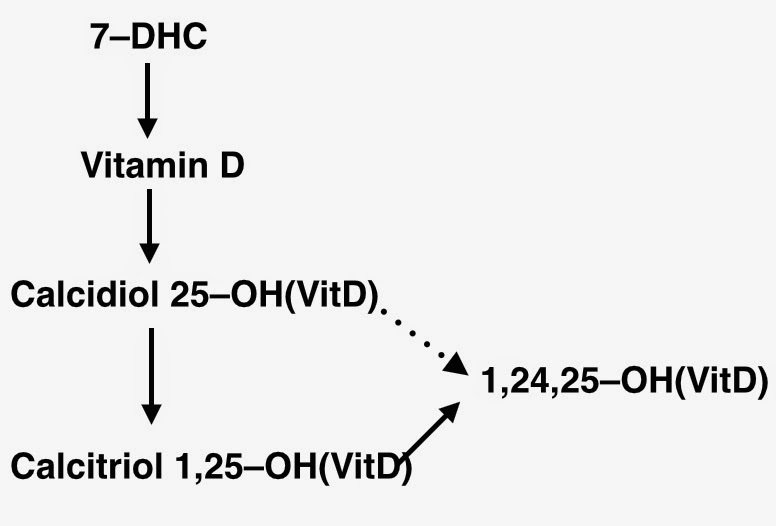 The high rate of conversion of vitamin D to calcidiol and calcitriol is matched by an increase of the –24 hydroxylation process leading to inactivation of calcitriol. However when the rapid peak of vitamin D and calcidiol/calcitriol has passed, the enzyme CYP27A1 will remain at a high level of activity. The absence of a large amount of vitamin D does not matter at this stage, but a high level of de-activation of calcitriol will remain. The result is a major reduction of blood levels of calcidiol and calcitriol until the next large injection is given. The message is that vitamin D should not be given in large bolus doses as this will result in a low blood level of vitamin D. It should be given gradually as in nature. Daily or weekly doses of vitamin D are fine, but single doses at intervals of a month or more are to be avoided. This information has been presented by Dr Reinhold Vieth of the University of Toronto, Canada.